Thomas F. McAllister was born in Grand Rapids, Michigan, on March 4, 1896. He was educated at St. Andrew’s School and Central High School in Grand Rapids. He earned a Bachelor of Arts degree from the University of Michigan, and an LL.B. from the Law School at the University of Michigan. It is difficult to ascertain the date of his graduation from the University of Michigan Law School. This stems from the fact that he gave a party one evening at the Lawyers Club and invited in some wandering players and acrobats. He assumed full responsibility for all of the excitement of the evening, and was asked to defer getting his degree for a brief period because of his indiscretion. Eventually, the University invited him to receive the degree that he had earned, and, in his gracious fashion, he did accept it. While still at the University of Michigan, he volunteered for the French Foreign Legion in World War I and organized a volunteer ambulance unit. McAllister also flew combat missions for two years and fought at the Marne, Meuse, and Verdun. He was awarded the Medal of Honor, the highest award that could be given to an airman in the French military forces. After the War, McAllister returned to Grand Rapids where he began practicing law with his father. 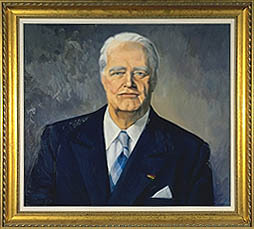 McAllister was elected to an eight-year term on the Michigan Supreme Court in 1937, and served on the Court until 1941, when President Franklin Roosevelt appointed him to the Sixth Circuit Court of Appeals. He married Dorothy Wonderly Smith, and they had two daughters. He had a personal library of over 6,000 volumes which included works on his lifetime interest, the law, his Irish heritage, and books about France.